The data visualization market was valued at USD 4.51 billion in 2017, and is expected to reach a value of USD 7.76 billion by 2023 at a CAGR of 9.47% over the forecast period (2018-2023). The scope of the report is limited to solutions offered by major players, including solution providers of both visual analytics and reporting tools. This report focuses on the adoption of these solutions by various end users in different regions across the globe. The study also emphasizes on latest trends, industry activities, and vendor market activities. With the advent of advanced analytical and business intelligence solutions, data visualization solutions, like scorecards and dashboards, which were usually deployed as a subset of a larger business intelligence solution, today emerge more flexible. In addition, these dashboards today have developed their own niche market, along with vendors offering best and customer-centric dashboard solutions to be used on top of current BI applications or other operational systems, like ERP. Deployment of these solutions on cloud is enabling their use on-the-go on mobile devices too. The increasing emphasis on measuring the performance of every operation across an organization to get daily or intra-daily view of their performances is driving the demand for these solutions in the market. Technological advancements within this industry along with rapid growth in big data and the growing need for faster decision-making are some of the other factors accelerating the growth of the market. However, the implementation of this software is complex, and many end-user case studies have reported challenges while aligning these solutions to make use of all the features due to the complex existing organization structure and complex implementation. Further, lack of skills to operate these new processes might challenge the deployment of data visualization applications market worldwide. 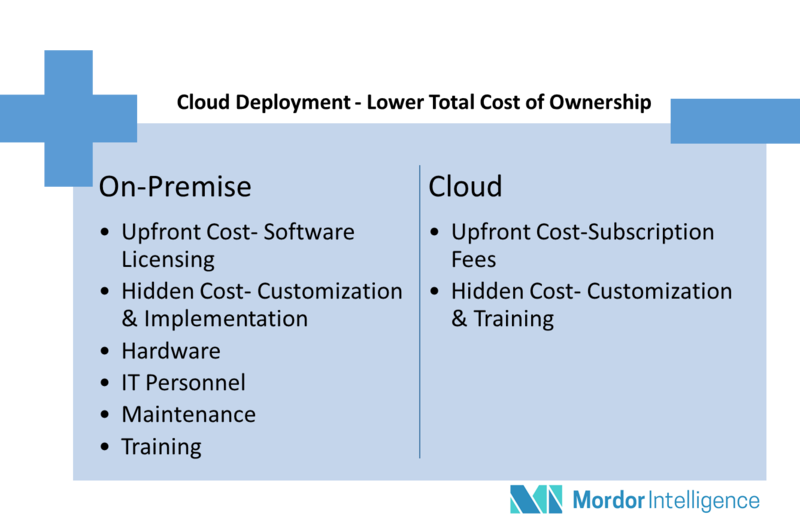 The deployment of these solutions over the cloud offers greater convenience as the service vendor is responsible for providing maximum uptime, data security, and periodic updates, thus decreasing the total cost of ownership. The current market trends including delivery of these solutions on the pay-as-you-go model and SaaS models (wherein the service vendors assume the responsibility of maintaining data and application information) are further driving the adoption of these solutions. Moreover, this mode has seen an increase in the deployment in small/medium-scale businesses as it cuts down the capital expenditure involved in building the required infrastructure on their premises. The banks today are growing in size and are expanding geographically; the number of branch networks grew leaps and bounds. Hence, the volume of transactions is witnessing exponential growth, and manual operations have become time-consuming and error-prone. As a result, a real-time or near to real-time data visualization has become prevalent in the market and teams today need dynamic dashboards rather than reports. To cater to a load of operations from all bank branches spread across all geographical regions, the banks have started using advanced visualization tools to track their operations. Integration of advanced capabilities, like machine learning, is further helping bankers to optimize their performances and reduce risks. It is reported that a large retail bank in the United Kingdom used machine-learning algorithms to identify fraudulent transactions with more than 90% accuracy. Banks and other financial institutions today are increasing their IT spending to leverage the benefits of the innovations in the market. However, with the increase in cyber terrorism, security of sensitive data, including, personal banking details, commercial banking details and confidential corporate information, are at stake. North America is the largest market for business intelligence in the world. The United States is the major shareholder in the North American region. In Canada, which was relatively stable during the recessionary period, the gains are more visible. The industrial sector is on a steady growth path, along with increasing influence of internet on the sales of industrial goods; hence, the increased demand for business intelligence and analytics solutions. 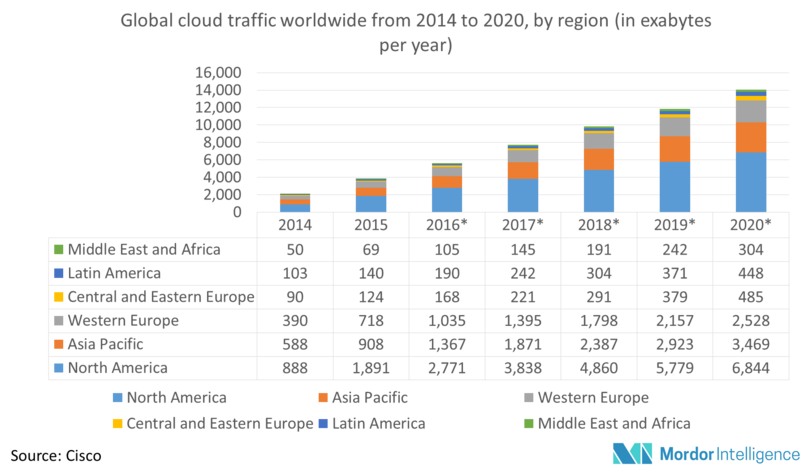 It is further reported by Dresner Advisory Services that North America is the global leader in adopting public cloud platforms for Cloud BI, with 60% of organizations either using or planning to use public cloud in 2017, followed by Asia-Pacific. The key players in this market include Tableau Software, SAP SE, SAS Institute, Inc., Microsoft Corporation, Oracle Corporation, TIBCO Software Inc., IBM Corporation, Information Builders, Dundas Data Visualization Inc., Pentaho Corporation, InetSoft Technology Corporation, and MicroStrategy Inc., among others. January 2018 – Tableau Software, Inc. launched Hyper, the new data engine technology included within Tableau 10.5. With Hyper’s ability to slice and dice massive volumes of data in seconds, customers can see up to 5X faster query speed and up to 3X faster extract creation speed. August 2017 - Oracle Corporation released the latest version of their BI solution named- Oracle Business Intelligence Enterprise Edition (OBIEE) 12.2.1.3 on August 2017. The suite provides enterprises with enhanced BI capabilities. The company is further investing in integration of artificial intelligence capabilities to it. January 2017 - IBM Security purchased Agile 3 Solutions, a San Francisco-based company that developed a security analytics dashboard aimed at helping executives understand cyber-security risks inside an organization. The acquisition gives IBM another tool in its security arsenal to provide more insight to key decision makers, which ultimately could help them sell more security services. How the growth in data production is driving the need for data visualization tools? Which end-user vertical is likely to witness highest adoption of these tools? Which deployment mode is expected to dominate the market? Which regions are expected to witness fastest growth during the forecast period? · This report can be customized to meet your requirements. Please connect with our analyst, who will ensure you get a report that suits your needs. 7.9 Dundas Data Visualization Inc.